I'm pleased to announce that Mifos X version 1.25, the world's leading platform for financial inclusion now can be installed automatically in minutes on Debian/Ubuntu or any similar distribution, using a deb package. I recently packaged Mifos X 1.25 into a Debian package and also setup a Debian repository for the same to facilitate this quick installation. For the impatient, jump straight to the section "Installing Mifos X 1.25 on Debian/Ubuntu". If you're still with me, read on for the back story.. This contribution came as a result of a recurring itch which I've been feeling for a long time now. This summer, I first tried to install the new Mifos X platform. At that time, I was new to Amazon Web Services and since I have a VPS with ample resources, plus a few Virtual Machines my preferred mode was manual installation on Ubuntu/Debian server. Following the steps in INSTALL.md and after the couple of hiccups, got it working on a Ubuntu VM and then installed an online demo on my Debian VPS. Over the months and weeks that followed, I often thought about improving this installation process and also found others on the mailing list facing problems getting stuck at some stage of manual installation. On a couple of Mifos users meetups Ed from the Mifos Initiative a lot of people run Mifos from Debian and Ubuntu though they did not have any concrete statistics on this. So finally I decided to answer this need and build the package and repository. After following all these steps there were a couple of issues I faced. First the MySQL root password had to be mysql. If it was something else, it wouldn't work. Second, the recent Mifos X releases require the use of JDK 7 but the default setting for Tomcat is to use JDK 6, so the /etc/default/tomcat7 needs to be modified to use JDK 7. Then, with the recent release, there was also the increase in memory requirement for Tomcat which needed to be configured in /etc/default/tomcat7. Apart from doing the steps mentioned above, I also ensured the deb package installation takes care of the above caveats, so now this installation process takes care of everything and gives you a working Mifos X setup with the provider app in the backend and the community app running on Tomcat. That's it! You'll be prompted for the MySQL root password, which is used to create the 2 databases, and the username and password of the account to access Mifos. You'll also be asked for information to generate the SSL keys since Mifos X community Application runs on HTTPS (HTTP over SSL). It is our hope that many more people will be able to get started quickly with MifosX through this effort. Spread the word and join us in the fight against poverty. As mentioned in my previous blog post, the architecture of MifosX makes it play very nicely with heterogenous technologies using the REST API and Webhooks to communicate. 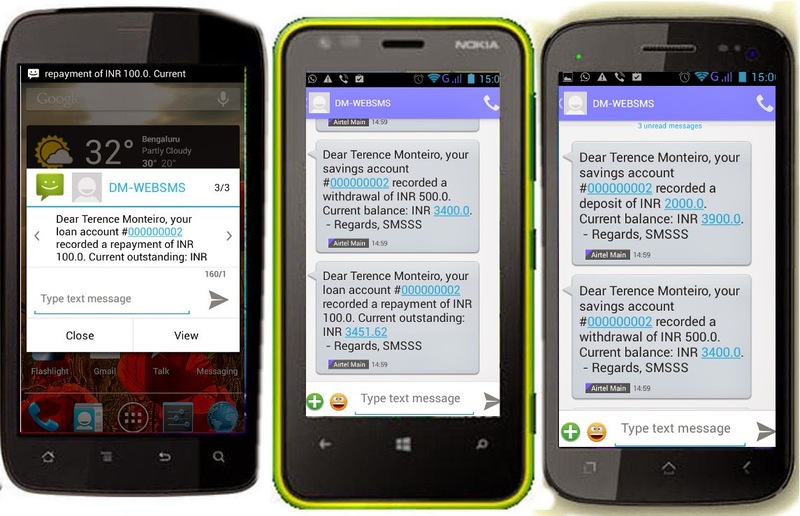 To fulfill my client's requirement, I started working on a SMS sending application to notify group members about financial transactions like loan repayments, and deposits and withdrawals to savings accounts. Having several years experience developing Web Applications, I've used several kinds of frameworks for different tasks. MVC frameworks like perl-Catalyst, ruby-on-Rails and python-django are great for developing modular applications. However, as the above code snippet shows, it's possible to get cracking with a much leaner and meaner application with a intuitive block for each request path and request type. I had the joy of using another microframework like Sinatra before: perl's Dancer framework. Dancer proved great for implementing a webhook handler app. With the help of CPAN's great array of libraries and modules, I could quickly develop an application with a few lines of code. Having emphasized the simplicity and speed of developing with microframeworks like Sinatra, it's flexibility with directory structure shouldn't deter those looking to write maintainable applications. Since ruby itself is object oriented and provides neat ways to organize a growing project, it's possible to write a perfectly modular and well organized and maintainable application with Sinatra. In fact, MifosX Messenger uses a handful of classes which specialize in the different functionalities required to get the app working. The workflow starts when a financial transaction is recorded in MifosX. 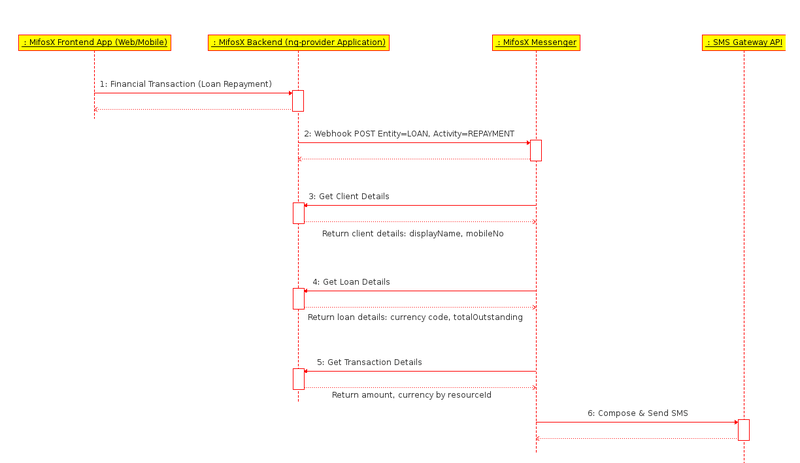 As the above sequence diagram shows (click for full size view), MifosX Messenger gets notified when any financial transaction it has subscribed to is performed. It parses the JSON in the POST request data received and uses the clientId, loanId and resourceId to fetch information from Mifos via the REST API. Once it has collected the necessary information, it uses a MessageTemplate class to construct the SMS and sends it to the mobile number of the client.